Small, a sport of Golden Tiara, green leaves have a crisp white edge, plant matures into a dense clump of variegated foliage, purple flowers appear in summer. Very popular and undemanding perennial. Grown mostly for its decorative foliage, plants remain attractive from spring till frost. Most flower mid-July to early August. 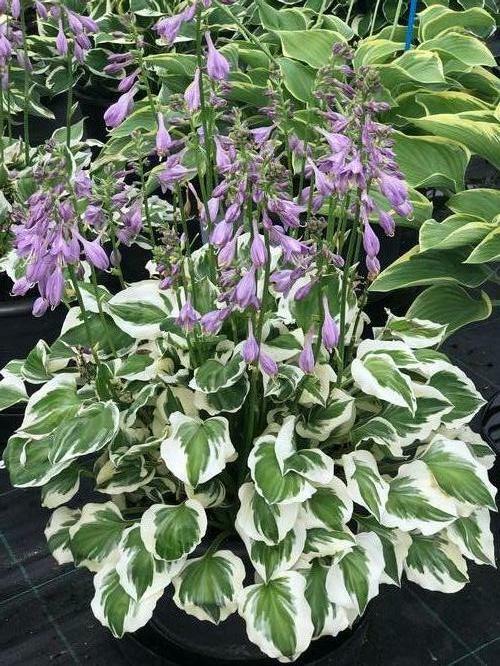 Hosta prefer partial shade, although a few will tolerate sun with adequate moisture. Use as a ground cover, for edging, or as an accent plant in the shady border. NOTE, SIZE: 25 X #1 TC: Look for this size for large bare root hosta grown from certified virus-free tissue culture. These hosta are grown for 2 years without digging and are tested 4 times per year for HVX. The 3rd year these hosta are dug, divided, replanted, and again tested 4 times for HVX. Any lots testing positive for HVX are immediatly destroyed. the 4th year these hosta are dug, graded fo rsize, and packed for export. These hosta are not divided at this time to minimize infection and transference of HVX. This ensures the greatest possibility of receiving a virus-free crop along with realizing the benefits of field grown hosta, i.e. larger roots and more eyes. Grow: Use well-drained soil with a pH 6.0 - 6.5. Center and plant so crown in 1" below soil surface, leaving developing eyes at or just below the soil surface. Spread roots evenly throughout the soil for faster growth. Temperatures: Grow at 50F minimum to stimulate growth. If growing outside in early spring, do not allow pots to freeze. Watering: Allow pots to dry slightly between watering, especially until growth appears. Fertilizer: Hostas are light to moderate feeders. It is best to incorporate a slow release fertilizer in the soil prior to transplanting. If topdressing is desired, apply to the top of the soil after potting. If foliage is present, careful application must not allow fertilizer to become trapped in the leaf petioles, otherwise some leaf burning may occur. Shade: Although some varieties are sun tolerant, provide 30% shade for best growth and quality.